The year is 1902. Industrial and scientific development reach their peak. The world of la belle epoque is a world filled with flying machines and steam engines. The vessels that are the most awe-inspiring, are the military airships, floating fortresses of imposing size and powerful armament. On August 1st, a new steam battleship is launched from the military airdocks on the outskirts of Vienna. The pride of K.u.K. industry, this is the first ship of a new series of Habsburg fighting vessels. This is the S.M.S. Monarch. This took a whole lot of time. From a tiny sketch made on a boring lecture at some point in May, to this final piece. Drawn on A4 paper with a simple ball pen. I believe it was a Pentel, but it doesn't matter. A pen is a pen. Note: The real-world Monarch-class Austrian battleships were smaller and of older design. This one is pure fiction, loosely based on Radetzky-class battleships from 1907/1910. This is beautiful display of love for nostalgia and science fiction! 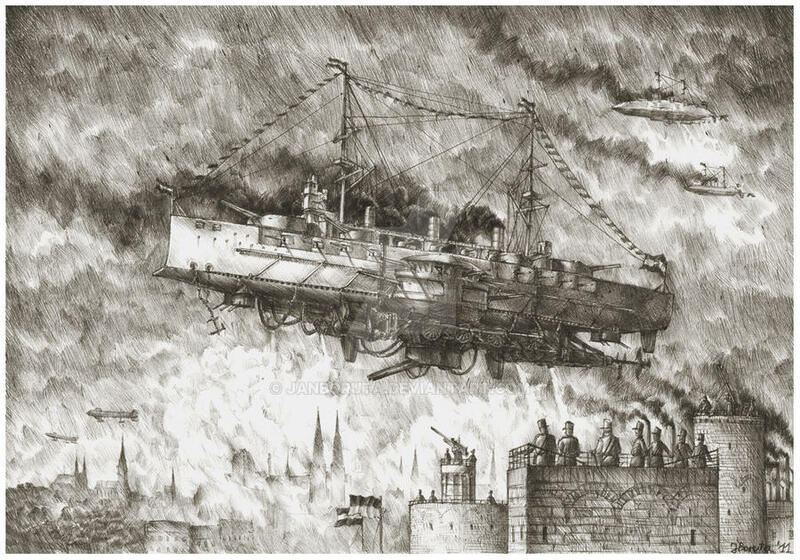 So I'm making a game about airships ( zarkonnen.com/airships ), and this picture is absolutely going into my "major inspiration" folder. That is legitimate. XD Nice! It's a shame that Polish TV hasn't shown many Czech films, only cartoons - and so I haven't yet watched Zeman's movies. Thank you for a great comment though. Steampunk may not be a genre for everyone, but it's a great practice for imagination I'd love to see steampunk done in your style, as you already excel in it when drawing history! Hey Tomek, this is a really cool drawing!! Thanks for sharing- this is actually quite inspiring. Somehow, I don't think steam jets are enough from a behemoth like that- perhaps she has a hull made of Cavorite? I prefer to keep it regular steel with some utterly expensive aluminium parts. I just like to think that the steam jets are extremely powerful to the point I can claim it;s magic As Arthur C. Clarke once said: any sufficiently advanced technology is indistinguishable from magic. Steam jets make me nervous. Anyone who happened to be standing underneath the ship when she took off would be skinned alive in seconds by the jets. 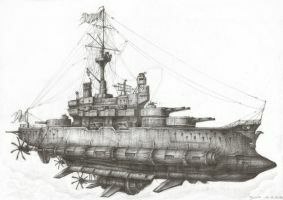 If the battleship belched out enough steam to hold her aloft for a few seconds without the aid of antigravity, the population of the entire city would be flayed alive (and that is ignoring the question of where the ship gets the water for her jets). what is her means of lift? I take it she retreives water for the steam system by some sort of cloud-condenser that takes advantage of rampant cumulus stormheads? This is badass, is it some kinda story you made? What keeps it in the air? Handy stuff. I hope nobody at the shipbuilders cut corners and decided to save money by using plummet-nickel instead. świetne te twoje sceny batalistyczne.powinieneś robić ilustracje do książek. Do Naomi Novik na ten przykład. Your art is rather mindblowing, If I could muster half the skill you have aquired I'd be astounded with my ability. But beyond just your art itself, the universe within which you draw from is fascinating as there seems to be everything one could imagine. Very very nice. Reminds me of the battleships from "Last Exile". Je fajn vidieť, čím všetkým by vzducholode mohly byť, keby sa Hindenburg nestrepal. Holt, vodík horí. te steampunkowe też są genialne! Nice! A bit of Duilio/Dandalo style flying bridge and funnel section, too. I like the texture on the sky; the direction of the strokes helps carry the eye upward. To be franc ,it's purely awesomely awesome! I hope you could make a tutorial or a video of you drawing,this could help people who haven't your talent. And I thought the sky here was lousy, I didn't draw one with a ballpen before. You need to make a single universe for these-all to inhabit, broseph. But the machines would alter the timeline, and philosophy is a necessary point for the development of science, even if nowadays it's a bit moribund and circular.